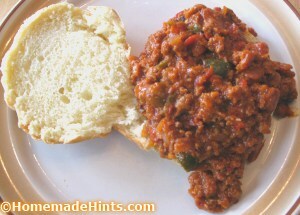 Homemade Sloppy Joes Recipe - You Don't Need No Stinkin' Man Can! You are here: Home / Recipes / Homemade Sloppy Joes – You Don’t Need No Stinkin’ Man Can! Homemade Sloppy Joes – You Don’t Need No Stinkin’ Man Can! You Don’t Need The Can Any More! Homemade sloppy joes is one of the easiest recipes you can convert from store-bought to homemade. I must admit, I am guilty of buying the sloppy joe can of sauce in the past and thinking I was still making it homemade. The Manwich name certainly would make any bachelor or man of the house feel like he was getting something manly and robust. But those times have past. One day I looked at the ingredients on the can and thought, well yeah this can is cheap, but for good reason. Tomato Puree (Water, Tomato Paste), High Fructose Corn Syrup, Distilled Vinegar, Corn Syrup, Less than 2% of: Salt, Sugar, Dehydrated Onions, Dehydrated Red and Green Bell Peppers, Chile Pepper, Tomato Fiber, Spices, Guar Gum, Xanthan Gum, Dehydrated Garlic, Carob Bean Gum, Natural Flavors. The canned sloppy joe sauce is basically tomato puree, dehydrated onions, peppers, garlic and some spices. How hard is that to put together at home? And you can add fresh onions, garlic and peppers and your own choice of spices. You can buy the tomato puree for way cheaper than the can of sloppy joe sauce and you certainly do not need to add guar gum, xanthum gum and carob bean gum. All those are thickeners to make you feel like there is more in the can than than really is. Would your momma have added guar gum? I don’t think so and neither should you. 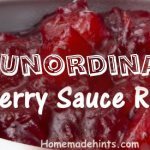 If you want sweetness, you don’t need to add high fructose corn syrup – which is the second ingredient in their sauce and again corn syrup at #4 which means there is more corn syrup than vegetables and spices. 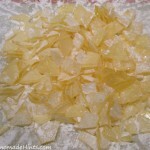 Add sugar or a natural zero calorie sweetner like Stevia if you want to balance the acidity. 1 lb ground beef, turkey, chicken, goat or even TVP (texured vegetable protein) if you want to go vegetarian. Hot peppers to your taste – i.e., jalapenos, serranos, etc. We like it spicy so we add a combination from our garden peppers. If you like things more mild, you may want to start with adding only 1 jalapeno with the ribs and seeds removed. Homemade Sloppy Joes. One Pan, No Can, Easy-Peasy! 16 oz tomato sauce – you can use whatever kind of tomato sauce combination you like. We even used V-8 one time instead of opening a new can of sauce. Combinations of extra seasonings/sauces such as mustard (powder or prepared), Worcestershire sauce and vinegar. Add a little, taste and adjust. 1 tbsp or to taste of sweetener if desired, either sugar, honey, molasses, stevia, etc. Assorted spices that you like. We have added different combinations of chili powders, cumin, Mexican oregano, etc. Experiment, add what you like, but I would suggest to be conservative in your amounts at first so not to overpower the mixture. Cook the onion and meat in a skillet until browned. Break up the ground meat while cooking to make crumbles so you don’t cook it in one big mass. If you have a fattier mixture of meat, pour off the excess drippings. I like it when there is just enough fat to brown the onions in without having to add oil. Now add the peppers and garlic and saute until soft, about 5 minutes or so. Add the rest of the ingredients and stir to combine. Reduce your heat to low and simmer the mixture, stirring occasionally, for about 5 minutes more. Easy Sloppy Joes Served on our Homemade Buns. 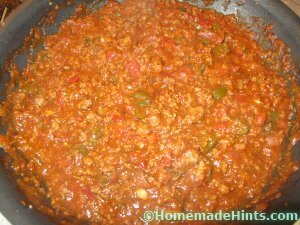 Now if you purchased a can of sloppy joe sauce, the only difference when making the meal is you do not have to dice up onion and peppers and add spices. Big whoop! How much time are you really saving? And for that little bit of extra time it takes to dice surely makes up for the awesome fresh taste, especially when you add the exact flavor combinations you prefer. This way you can make the best sloppy joes from scratch without relying on a can with funky ingredients Johnny can’t pronounce. Question: How do you make your Sloppy Joes? What special ingredients do you like to add? 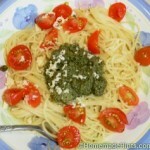 Homemade Basil Pesto Sauce Recipe for Pasta, Pizza, Salad & More! This sounds delicious! 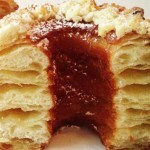 It’s even somewhat Keto-friendly if you use some extra fat, use cloud bread and a safe sweetener.